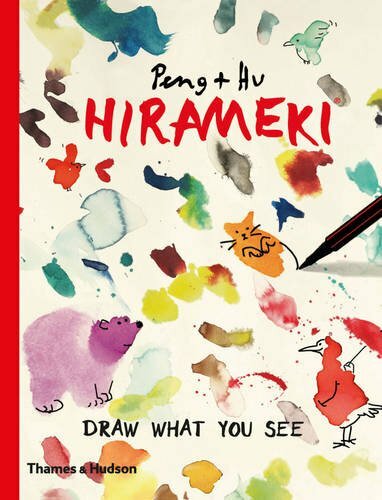 Book Review: Hirameki: Draw What You See! This book's authored by two artists Peng and Hu, and on the cover it has them listed as Peng+Hu. Hirameki: Draw What You See! is a fun book that doesn't take itself too seriously. For the activities within, it recommends that you use a pen no longer than your arm, and no shorter than your little finger. The authors see every blob or splash of watercolour as inspiration, and invites you to imagine and draw with what's already on the page. Strange shapes made by watercolour can be added with wings and beaks and they suddenly turn into birds. Sometimes you can draw hands and legs and you'll have someone dancing. So it's really up to you to interpret what you have. There aren't a lot of instructions. The idea is self explanatory. The 192-page paperback is filled with examples for sparking your imagination. I find it quite fun to just splatter watercolour at times without any purpose and see what I can come up with.